Wow, two days in a row that i am not rushing from appointment to appointment. So i thought, lets get wild and write two posts in a row before the working world gobbles me up again on monday. Society tells us to embrace our flaws and yes i am starting to come to terms with my big but, my complete lack of upper body strength and my incapability with numbers but when it comes to my face i scream a loud : "Yes please" when it comes to conceal my flaws (yes, i am reading this Amy Poehler book ;) ). So well i have been on the look out for the perfect concealer which will cover my imperfections best on a "as long as i show my face in public" basis. That can mean anything between 2 and 16 hours. The second challenge for my concealers is that i am about the colour of this background. Nah ya, not quite as bad but i was also surely not in the first row when they were handing out the melanin. So well let me introduce you to some of the contestants and how i rank them. 1) The Collection Lasting Perfection concealer in their lightest shade. I think this is one of this holy grail products which is still lacking any worthy contender. It is very affordable. Absolutely gets the job done and lasts forever on my skin and come in the perfect shade which is slightly lighter then my skin tone (the recommendable tone for any concealer). I have never seen a negative review on this one. Negative point. They do not sell it in Belgium or Germany or any other country i would be reaching on a monthly basis. So while i will stock up on this on my next London trip i try to use this little tube carefully. 2) The Maybelline Instant Anti-Age eraser for the eye area. A wonderful under the eye concealer with a slight highlighter function. The slightly yellowish tone perfectly conceals dark rings under the eye and the slight shimmer gives it a bit of a highlighter effect.. The sponge applicator gets the job wonderfully done. However, also due to this i would not use it on blemishes since it strikes me as unhygienic. This baby is available in Germany so i can stock up on it when i visit my peeps. I also use the lightest shade here. 3)The Maybelline Fit me concealer again in their lightest shade. I do own the powder from this range too and its a favourite of mine so when i saw this in the store i want to give it a shot. The second plus point for me was that it is liquid and comes with a doe foot applicator which are my favourites when it comes to concealer. This concealer is so far the closest thing i could find to the collection concealer. It goes very well with my skin tone. However, it is a bit thinner then the collection one and does not last quite as long. But for me it is the best alternate i can find in my reach. 4) the Rimmel Hide the Blemish Concealer. I picked this up not to long ago, when Rimmel products were on sale and i actually quite like this creme based concealer. It kind of looks like a lipstick and it comes again in very good very light colour. It is quite creamy and applies very well and it is a close contender to the Maybelline Fit me concealer. I like to have this in my handbag for touch ups since it blends very well. 5) The L'oréal true match touche magique in light beige. I saw recently that they sell this also in ivory beige, just i never seem to find it in my store. This is the concealer to the much loved true match foundation from L'oréal. It is not to bad and also liquid, so i guess thats good. I do not love the applicator. It comes with a brush which gets supplied with the liquid when you twist the bottom (of the pen, not your own). I always get either to much or to less on. The shade i have really does not match my skin though. But to be fair, i should probably try one day to get my hands on the lighter shade. However, i think i would still prefer the Maybelline Fit me concealer sipmly already due to the applicator and to texture. I know suprise, suprise since it is such a holy grail product for so many people. I just do not get on very well with this concealer. Beside the fact that it does not fit my skin colour very well, i do not like how it applies and it does not give me the coverage i need. To be honest i just have no use of light coverage concealer. If i put on concealer, then it is usually necessary. Everything which gets covered already by my BB cream is not really in need of concealer for me. I got it as a sample size which i am happy about. It however makes me wonder if maybe the packaging changed the consistency. Would love to hear some feed back from you guys. 7) The Maybelline cover stick. I am not sure if i was just never lucky enough to find a lighter colour but this colour is way to dark for me and the concealer does not apply very well. It is kind of draggy and i have to go several time over the blemish to get enough product off. It kind of does the job and is better then no concealer but well, not my favourite. 8) The So-Susan concealer quad Ye sorry but this product is really not for me. None of the offered colours even remotely matches my skin. The texture is very weird. I got it in a glossy box and i am happy i did not pay for it seperatly. I think this one will actually go towards trash. It is supposed to be priced at 22 euro which i find very steep for this quad. To be honest in general the So Susan stuff has been a bit of a hit and miss. I have a very nice blush from them and my sister has a mascara she likes, however, there have been near riots on glossybox already when they send out their products because people hated it. So well, form your own oppinion. 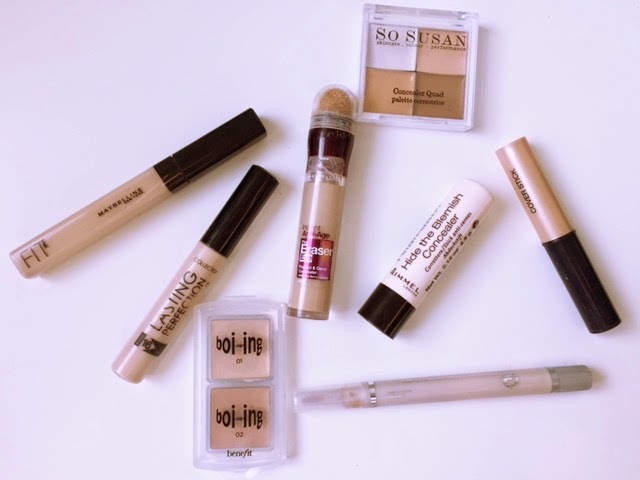 On my to try list for concealer is still definitley the Rimmel Wake me Up Concealer which i heard very mixed review about (Fleur de Force featured it on the worst of Rimmel while Amelia Liana has it under her favourites. Another one i really want to try is a Nars concealer cause i heard a lot of good things about it. What are your favourites? Ik hou ook enorm veel van de Boing! Die verpakking (met twee-in-een) is zo praktisch! Plus, de kleuren kan je makkelijk blenden zo! Wow! Jij hebt er echt veel getest! Ik ben wel benieuwd naar die van Collection. It is one of this holy grail products totally worth the hype. It is also really cheap to boot. I wish they would sell collection in germany, netherlands, france or belgium aka, countries within affordable reach. London is close qua hours but quite pricey to visit.